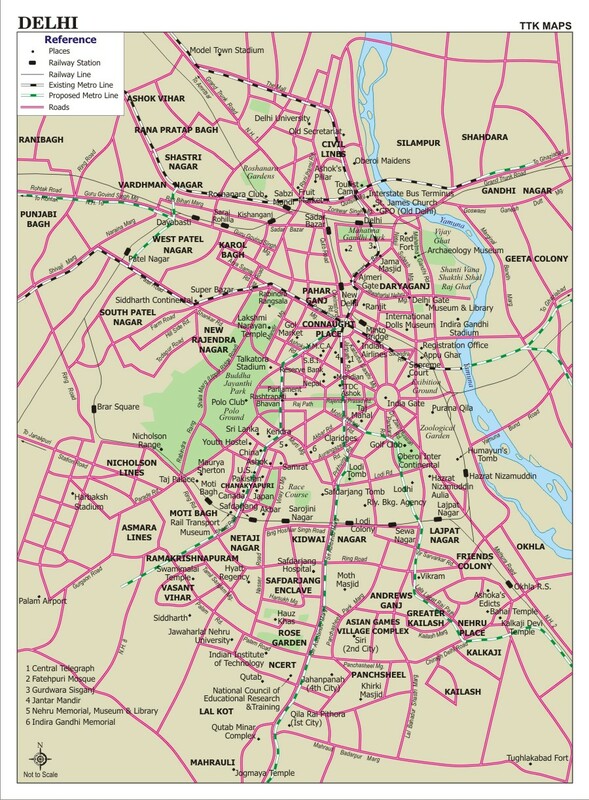 Editor’s note from mattyillini: “Popeye” is a new contributor to Borderstan and will be posting “Delhi Dispatches,” periodic reports on life in Delhi, India. He and his wife, “Olive Oyl,” are former Borderstanians, neighbors and friends of ours. 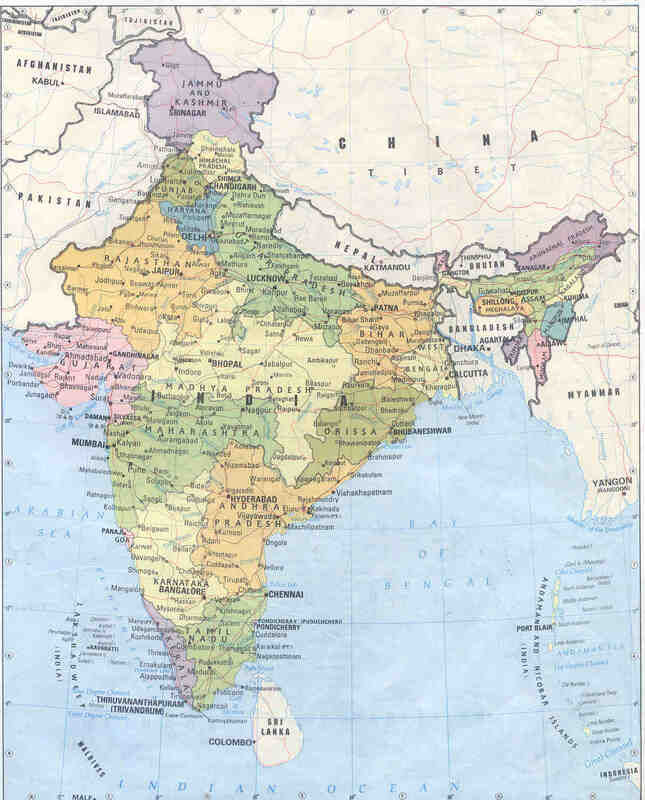 They moved to India almost two years ago (Olive Oyl is originally from India) and are the proud new parents of a baby girl, “Swee’Pea.” No, these are not their real names, but there are lots of strange people out there and Popeye asked that we use pseudonyms. This morning, Olive Oyl and I had an appointment at the U.S. Embassy in New Delhi, the capital, to apply for our daughter’s U.S. passport. As we were getting ready to head out the door–rummaging through documents at the last minute, etc.–the doorbell rang. Happy at the thought of our driver arriving a few minutes early, I walked out onto our balcony expecting to look down and see our taxi driver waving up at me. To my surprise (astonishment, really), I saw a group of about 10 eunuchs looking up at me who, upon seeing me, immediately started singing at the top of their voices, dancing and playing musical instruments. 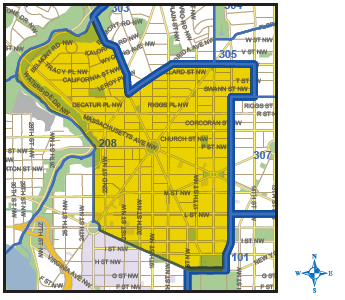 The September meeting of Advisory Neighborhood Commission (ANC) 2F/Logan Circle is Wednesday, September 2 at 7 p.m. Same location: Washington Plaza Hotel, 10 Thomas Circle NW. An organization called the Texas Nationalist Movement (TNM) is working to convince Texans to declare independence from the United States. The group’s Mission: The Texas Nationalist Movement exists to secure and protect the political, cultural and economic independence of the nation of Texas and to restore and protect a constitutional Republic and the inherent rights of the people of Texas. TNM is asking Texans to sign a petition to demand that the Governor and Legislature of Texas conduct a referendum on whether Texas should again become a sovereign and independent nation. The group also says that the Texas state constitution of 1876, which Congress approved, gives Texas the right to secede. For those of you who don’t know your U.S. history, Texas was an independent republic, 1836-1845–after fighting to separate from Mexico and before joining the Union. What’s your opinion on the desire of some Texans to secede from the United States? The Washington Blade has a good story this week that summarizes the “gym wars” between the owners of Results Gym (Doug Jeffries) and Vida Fitness (David Von Storch). In a nutshell: Von Storch (who also owns the Capitol City Brewing Company restaurants) owns the 1612 U Street NW property, which is also the location of the original Results Gym location. Jeffries’ lease is up in early 2011 and Von Storch is taking over the space for another Vida Fitness location. (Full disclosure: I am a long-time, happy member of the Results location on U Street). For background, read the Blade’s story from March 17, 2006, “Gay gym owners spar over Results’ U Street location; Results’ Jefferies says landlord von Storch is envious and ‘jealous’. The Washington Business Journal also had, Gym owners face space race in beefed-up market, on March 10, 2006. Me or the Dog? Both of Us? Okay. I ask because of the height of the fence. Of course, it is 15th Street and we do get our share of wandering-home-drunks. Garden District is closing its second store at the corner of 14th and Church Streets NW and moving the merchandise to the original location at the northeast corner of 14th and S NW. The last day for the Church Street store, which focused on indoor plants, is Tuesday, August 31. Only here… one of the nice things about living in Borderstan is that you meet people who do unusual, interesting foreign policy stuff that allows them to travel to cool places. Dupont Italian Kitchen at 1637 17th Street NW is a ” classic” in the neighborhood. Always a good bet for fast, affordable food with good, basic Italian dishes. Just do not expect more. It is a great place to sit on the patio and watch people go by on 17th Street. Creme Cafe at 1322 U Street NW has now been open for four years with its wonderful offer of “home-cooked” meals. We ate there once and the food was delicious… sort of a mix of southern flavors. If you are feeling like soul food, you should give it a try. Kenney Chesney performs on Saturday, August 29, at Nissan Pavillion, 7800 Cellar Door Drive in Bristow, VA. Don’t miss a concert that promises to be fun with great songs (I like him). B.B. 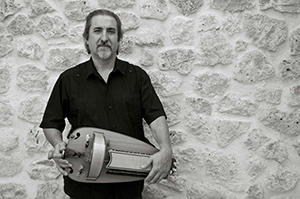 King plays on Sunday, August 30, at the Filene Center at Wolf Trap… a great way to end the weekend. 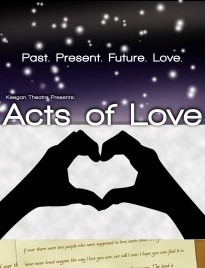 “Acts of Love” is a series at the Church Street Theater, 1742 Church Street NW. A show that is part of the series and closing this weekend is “False Romance: An Intergalactic Farce” by Joe Baker. Starting September 2009, PSA 208’s leadership team invites you to attend the first Monthly Walk with Your PSA 208 Lieutenant. The purpose of this monthly walk is to extend the already scheduled PSA 208 Monthly Meetings out to the community and citizens, by affording you and the leadership an opportunity to walk through your neighborhoods while discussing community concerns. If you happen to hear or see planes directly overhead tonight, it will be a training flight exercise being conducted by the North American Aerospace Defense Command (NORAD). According to Alert DC (see complete message below), the exercise will take place in the DC region between midnight and 2 a.m. I still remember seeing the Air Force fighters on patrol over Washington in the weeks after the September 11 attacks eight years ago. And since Borderstan is close to The White House, we sometimes awoke in the middle of the night to the sound of large military helicopters in the neighborhood flying close to the ground. It was always a thrill to wake up at about 3 a.m. with a helicopter hovering over our house. 17th St Dog Park to Open on Sept 2? DC Striving says “yes” in Could it be true? Should our dogs rejoice? Here is the last posting on the park: “K9Grass” is the Bright Green Stuff at the New Dog Park . Hope you enjoyed the weekend… yesterday was spectacular… Labor Day is just two weeks away. Perhaps JJ’s will be open for cheesesteaks by the time it’s sweater weather. Luis took this photo yesterday of the location-to-be at 1939 14th Street NW, (just off U Street). There appears to be a bit of work left on the shop. Not surprisingly, Wikipedia has an entry for cheesesteaks. Dog walkers, early commuters, gym goers: The early morning hours on the street can be dangerous… it’s still dark and there aren’t many people out. If you are out and about on the streets in the early morning hours, take the same precautions you would if it were midnight. I just got these two Police Alert emails in the past hour… I happened to be up early for work. Robbery Force and Violence, 5:03 a.m., 17th and R street NW. Lookout for 2 B/M on a bike one of them with a heavy build. Do not take action, call 911 w/event #I20090468341. Sent on: 08/24 05:09. 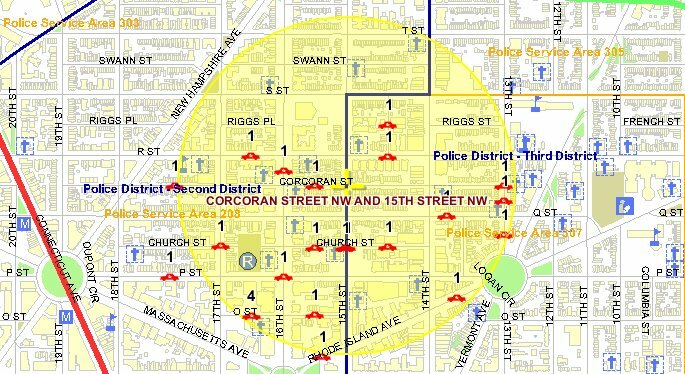 Robbery with Force and Violence, 5:00 a.m., 1100-block of U Street NW. Lookout for 3 B/M wearing white shirts and blue jeans. Do not take action, call 911 with event #I2009468338. Sent on: 08/24 05:04. This map from MPD’s crime database shows the location of thefts-from-autos in Borderstan in July 2009. A huge problem in the Borderstan crime area¹, there were half as many thefts from autos in July 2009 as there were in July 2008, but still twice as many as in July 2007. Total crime (both violent and property crimes) for the month of July 2009 in the Borderstan crime area¹ was down when compared to July 2008. There were, though, more crimes in July 2009 than in July 2007 due to a higher number of property crimes. We provide you with historical numbers in order to get some sense of the direction of the crime rate in the neighborhood. It is possible to obtain crime statistics from the DC MPD online crime database for up to two years. Total Crime. There 68 total crimes in the Borderstan crime area¹ in July 2009 compared to 88 in July 2008 and 59 in July 2007.